Hardy, summer perrenial. The new shoots are picked as they appear above ground. Plant in deeply trenched, composted, raised beds. Used in salads, stir-fry, raw or lightly steamed. 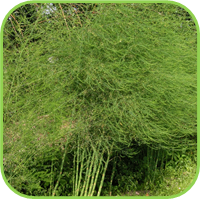 • Allow the foliage to develop and grow during late summer and autumn, as this is necessary for the following season's crop. • Year after year the crop of shoots will improve in quantity and size. A plant can be productive for up to 20 years. • WARNING: Berries are harmful if eaten. • Do not plant with: Onions. • Steamed or lightly boiled and served hot or cold as a vegetable. • As a warm dish it can be served with a lemon and butter sauce or with a cheese sauce. • Cold, with an oil-and-vinegar dressing. • Puréed or finely chopped in soups. 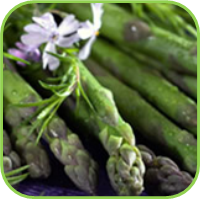 • A source of folic acid and selenium. • Neuritis - inflammation or deterioration of a nerve, usually peripheral. 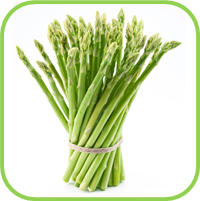 •Asparagus root contains steroidal glycosides, which affects hormone production. •It is very nutritious and is essential for the production of red blood cells. •Acts as a tonic to the liver, and may be used in cases of liver congestion and conditions such as hepatitis to encourage healing. • Dried leaf: 5g per day. • 5 ml, 3 times per day. • Recognized as safe by the FDA. It has no known toxicology. As with all cholagogues, persons with acute gallstones should exercise extreme care in using such agents.